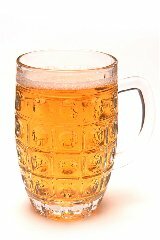 A pint Beer glass is used to serve most beers and lagers in the United Kingdom. This can either be in a straight glass or in a beer mug which has a handle. In some other European countries, however, that is not the case. Many brewers design beer and lager glasses to suit their own brand and by adding their company logo it also becomes a useful marketing tool. Not many of us fully appreciate the research and development a brewer invests his time and money in to develop the ideal glass to enhance the flavour and aroma of his product. Some beers are more suited to a glass with a wider opening, this stimulates the sense of smell as well as the taste buds leading to a more enjoyable experience. Lagers should be served cold, therefore by designing a glass with either a handle or stem will stop the warmth from the customer's hand being transferred to the lager inside the glass which keeps it colder for a longer period of time. The shape of the glass will also affect the appearance of the beer or lager. A good glass of beer or lager should have a healthy frothy "head" on the top of it. By using a glass wider at the bottom tapering to a narrower opening will force all the gassy bubbles into a smaller area and lengthen the time the "head" will last. Then, of course, there are the novelty beer glasses. Possibly one of the first novelty beer glasses was the "yard of ale" glass. Often used in bars and at parties as a game this glass has a bulb at the bottom with a long thin neck and a wide opening. The willing victim is supposed to drink the full contents of the glass without stopping. This often results in some hilarity and often a soaking for the victim is he or she cannot drink quickly enough. Another popular glass to drink beer from is shaped like a boot. To the uninitiated the natural way to drink from this glass is to hold it with the toe pointing upwards. When enough of the contents have been drunk so that the beer comes out of the toe section it does so with such a rush that the person drinking from the glass often ends up wearing some of the contents. The trick is to drink from the glass holding the toe to either the right or left side. The beer will then flow gradually from the toe and the person will be able to enjoy the beer right to the last drop. How would you like to drink your beer from a cool, red glass? Available from Red Candy Ltd.